So we all as parents try and make sure we give our babys or toddlers the very best. Nybabyshow and i saw some great and awesome products. One in particular was from a Company called Attipas Shoes. They make baby and toddler shoes. 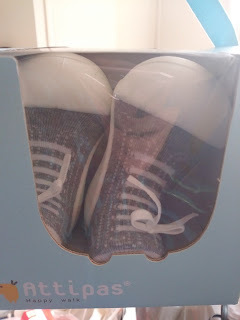 They are the most cute baby shoes i saw, one because we all put our babys in socks. So now theres a shoe that has the sock like feel with a rubber sole. I thought this was neat because the shoe looks cool but also does the job by providing comfort to your baby and it also helps them walk better. 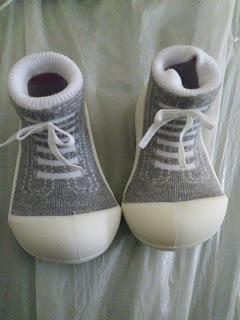 They provide much support to them walking and they run in sizes for babys all the way to preschool age children. Its a light weight shoe and comes in many styles for boys and girls. As you can see in the picture i got to check out the grey sneaker looking one. The shoe is made very well and you can even wash the shoes so that will help alot. The sole makes for toddlers to not slip and fall if they are running or walking on wooden floors. They come packaged in a cute little box. And they go by sizes s to xl babys to 4 years of age. And i have some good news Attipas shoes is sponsoring a giveaway for a free pair of shoes for either a girl or boy design is random. All you have to do is follow the instructions in the giveaway and enter the giveaway. It will run today till june 26th 2017 so if you wanna try a pair enter the giveaway. Good luck to all. All is my own. And giveaway is sponsored by attipas shoes.